In a bowl, mix the quinoa, broccoli, peas, olive oil, lemon juice and herbs. Season with salt and pepper. 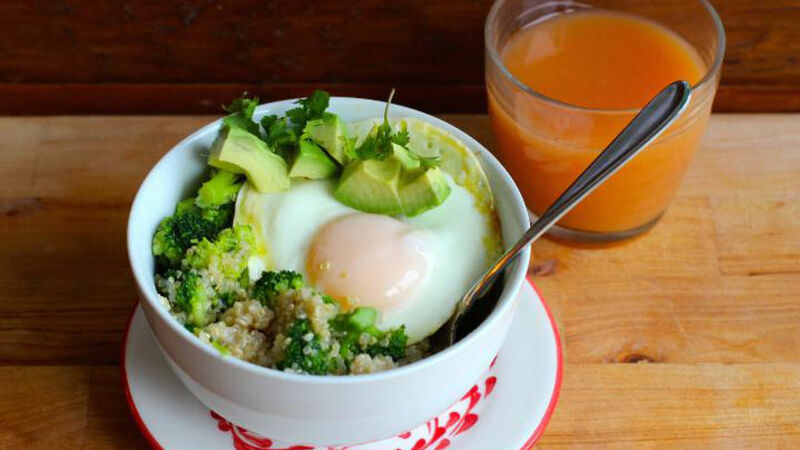 Serve the quinoa in bowls with an egg and pieces of sliced or diced avocado over the top. Prepare the quinoa and vegetables ahead of time and store in containers or plastic bags until you’re ready to assemble this dish. Of all the meals, I put special emphasis on breakfast. Today, I bring you a deliciosa recipe to start off the day in a sabrosa, filling way: a quinoa bowl with veggies and egg. For those who don't know, quinoa is a seed originally cultivated in the Andes. The Incas considered it a sacred grain; it's a strong plant that can grow in the most adverse of conditions. It's been raised for more than 5,000 years in the Andean territory that today is comprised of parts of Argentina, Peru, Bolivia, Ecuador and Columbia. Quinoa is versatile ingredient, a great substitute for rice and couscous, with the advantage of being a light, easy-to-digest whole grain.